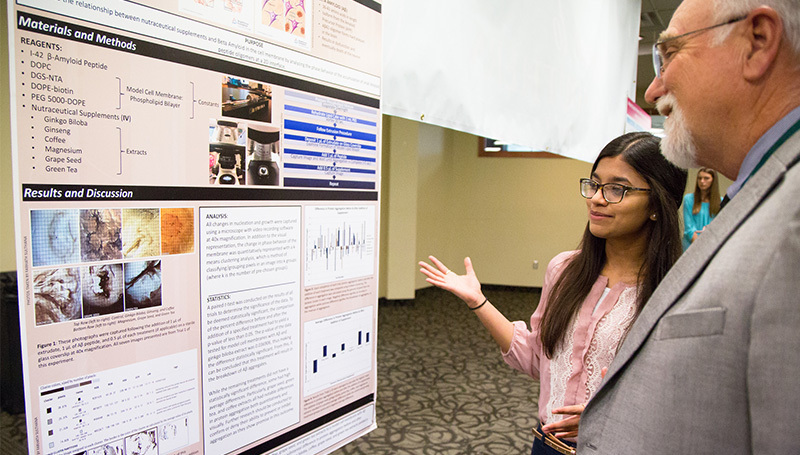 Students will have the opportunity to showcase their research beyond the classroom during the 2018 Student Research Symposium, to be held from 1 to 4 p.m. Wednesday, April 25, in Connor Ballroom at Missouri Southern State University. More than 30 entries will be featured in one of six categories: Humanities; Business, Engineering and Technology; Social Sciences; Physical and Biological Sciences; Health Sciences; and Education. Students will create a poster presentation to visually share their work. A panel of judges – from on and off campus – will determine the winners in each category. First- and second-place winners will be announced for each category, and there will be a prize awarded for the best overall poster. A faculty-led panel titled “Getting Started in Research” will be offered from 2:30 to 3:30 p.m. in Room 341 of Billingsly Student Center. The session will be led by Dr. Jason Willand in Biology; Dr. Maggie Beachner in Education; and Dr. Megan Bever in History. They will discuss research opportunities at Missouri Southern and how students can get started with faculty-mentored projects.